Mealybug is the common name given to insects of the Pseudococcidae family. There are many different species of mealybug, all of which are un-armoured scale insects that feed on plant sap. Most inhabit plants that grow in moist, warm climates. Many greenhouse crops are susceptible to mealybug infestation where the protected environment is often perfect for their survival. Indoor plants, cacti and succulent plants are also favoured hosts for mealybug. Mealybug infestations are often recognised as fluffy white growths around leaf axils on plants. This is actually wax that the adult females secrete around themselves to hide within and protect their egg masses. Eggs hatch into tiny orange-coloured larvae that rapidly migrate from the egg masses to new locations and plants. Male mealybug are very different in appearance to the females as they are much smaller, have wings and resemble tiny dark-coloured wasps. Heavy infestations of mealybug often lead to honeydew contamination of the host plant, which not only makes the plant sticky but also encourages the growth of sooty moulds. This can also lead to leaf drop and even plant death. Independent research studies have shown that SBPI can be highly effective at controlling common mealybug species such as the Citrus mealybug (Planococcus citri) and the Glasshouse mealybug (Pseudococcus viburni), if used correctly. 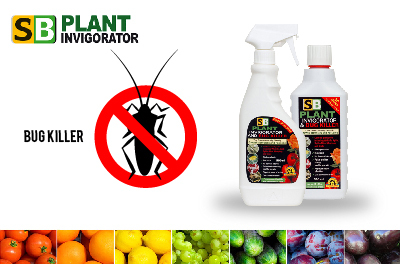 A thorough application (to upper and lower leaf surfaces) of SBPI applied to the point it runs off the plant, followed by a similar application one day later will be required to control an established infestation of mealybug. The initial application will remove the protective wax from the adults and the second application one day later should effectively kill them. Eggs and the small mobile juveniles are more difficult to control with SBPI so further regular applications of SBPI at weekly or fortnightly intervals are recommended to ensure the infestation is fully eradicated. Continued regular use of SBPI will protect plants from further established mealybug infestations. Spraying as often as weekly may seem excessive but please remember SBPI provides a foliar feed, comprehensive pesticide and mildewcide all at the same time. Most people who use SBPI weekly rarely have to use other products. Resistance to SBPI will not occur due to its physical mode of action.